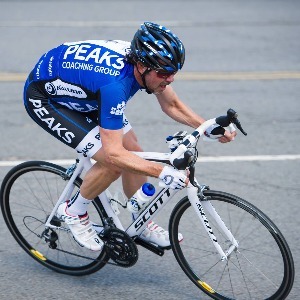 I am a coach with the Peaks Coaching Group, the experts in training with a power meter and data analysis. I have been riding and racing in the mid-Atlantic area since 1984. What started as a cheap way to get to school and work has grown into a healthy lifestyle based around cycling. A second place in my first road race hooked me and I have never been tempted to give up the sport, no matter how sparse the results have been over the years. I truly love riding my bike and would probably still ride every week even if I weren't racing. A full time job, a desire to spend a lot of time with my family, a less than maintenance free home and an actual lack of physical talent have given me the opportunity to learn how to get as much out of the time I have on the bike. I have learned how everything that you do, from working, training and eating right to getting enough rest and even the people that you interact with, can affect your results and even your entire season. Hopefully you will be able to benefit from the lessons I have learned. Success. Coach BJ Basham has been notified of your message.